The secret ingredient in this recipe is pomegranate molasses, a viscous syrup made from the juice of pomegranates. Sweet, tart and sticky, it adds a unique flavor to marinades and sauces. I like to use it with chicken breast meat, because it gives a welcome flavor boost to the mild white meat, and the sugars help to caramelize the chicken while grilling. Pomegranate molasses is a popular Middle Eastern condiment, and can be purchased in the international section of your supermarket or at specialty stores. I made these skewers for a cocktail party I catered a few weeks ago and posted a photo without a recipe on Facebook and Instagram. They were a huge hit with the guests – and my followers – and a number of you asked for the recipe. At last here it is. 1. Whisk the marinade ingredients in a small bowl and set aside about 1/4 cup for basting. Place the chicken in a large bowl, pour the marinade over, and stir to thoroughly coat. Cover and refrigerate the chicken for at least 4 hours or overnight. Remove the chicken from the refrigerator 30 minutes before grilling. 2. Whisk the sauce ingredients in a small bowl and refrigerate until use. 3. Prepare the grill for direct cooking over medium heat. Thread the chicken on pre-soaked bamboo skewers. Grill the skewers over direct heat, basting once, then turn and continue to cook until the chicken is lightly charred and thoroughly cooked through, 10 to 12 minutes, turning again as needed. 4. 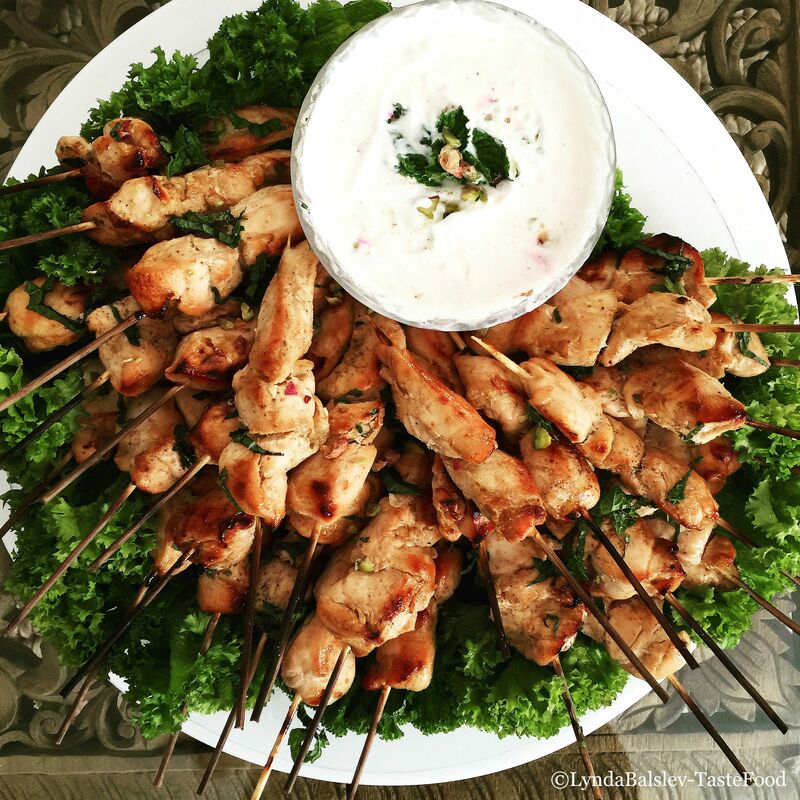 Arrange the skewers on a serving platter. Lightly drizzle with oil and sprinkle the pistachios and mint over the skewers. Serve with the dipping sauce. Those skewers look and sound delicious! Middle Eastern food is so scrumptious.